Excellent result for blending kale. Excellent result for green smoothie. Excellent for frozen fruit smoothie. Excellent result for crushing ice. The rubber seal sits on the outside of the blade assembly making it easy to remove and replace. Loop for attaching cup to belt during exercise. Can vibrate and move along the bench. Although suitable for travelling and using when exercising, it is heavier than most single serve bottles to carry. Brushed stainless steel option has RRP of $945. 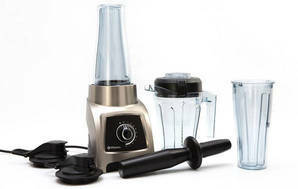 "Vitamix S30 packs a punch"
26 May 2017, Anne K.
Smaller footprint means it doesn't take over a small kitchen with limited bench space but still has very good power output and reliability. Reputable brand. Only downside is that after using it needs to be "dismantled" to clean - the blade section is removable with a rubber or silicone gasket that also needs to be removed and washed - not like the its big brother Vitamix that just needs water, a bit of detergent and a minute or less on blend for a deep clean.